Shaun Joyce, music industry executive. Died aged 38. As director of marketing and buying at Sounds Music, Shaun Joyce was one of the most powerful figures in the New Zealand music industry. His ear for a hit, passion for rock'n'roll and enthusiasm introduced numerous bands to the New Zealand public - and contributed to the success of the Sounds chain, now the country's largest independent retailer. Born on June 4, 1966, and raised in Te Awamutu, Shaun was a huge fan of Jimmy Barnes. He dreamed of becoming a rock star himself. In the 80s he got a taste, playing drums with bands Joe 90 and the Pink Torpedoes. But his real talent was working with people. It is typical of Shaun that his foray into the music industry was of his own doing. While working as a trainee manager at Woolworths, he positioned himself as manager of the record bar. Joyce started working at the Woolworth's record bar after responding to an ad he saw in the window, whilst on his way to sign up with the Territorials, an option which fell by the wayside once he discovered he could forge a career working with music. He eventually ended up as a store manager for one of the HMV shops; and when the HMV chain was sold to Australian chain Brash's, he was brought in by Sean Coleman on Jerry Lloyd’s recommendation when Coleman established the Sounds music stores in 1991. Sounds started with 2 stores in Auckland, which expanded to 49 stores nationwide, with Joyce's influence a huge part of this success. After a brief OE to Australia, he went to work for music chain HMV, managing the Manner's Mall store under Jerry Lloyd. When HMV was sold, Lloyd recommended him to Sean Coleman, who started the Sounds chain in 1991. While he was there Sounds grew from two Auckland stores to 43 nationwide. 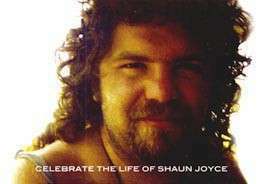 In 2004 Shaun posthumously received the Lifetime Achievement Award from RIANZ president Michael Glading. In his tribute Mr Glading described Shaun as a person who championed artists saying many, both local and international, owed their music triumphs in New Zealand to Shaun.